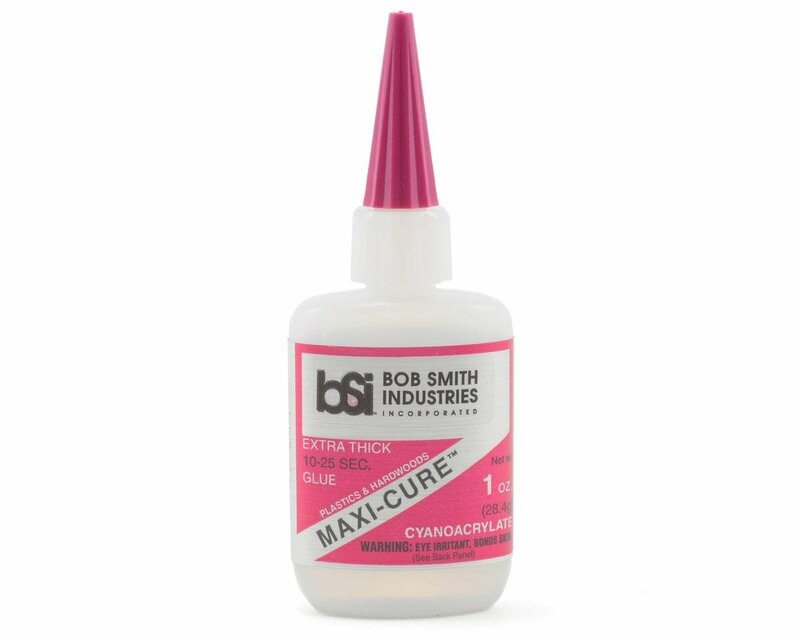 This is a one ounce bottle of Bob Smith Industries MAXI-CURE™ extra thick CA glue. MAXI-CURE™ extra thick CA is the best CA for most plastics, including GE’s Lexan MAXI-CURE™ is the best choice for plastic model assembly. When used with INSTA-SET™, it works better than any putty for modifying or filling voids. It can be carved with a knife or razor blade and sanded and feathered to form a finish indistinguishable from plastic. MAXI-CURE™ bonds fiberglass, hardwood, metal and rubber better than any other hobby adhesive. For gluing to the inside of a cloth textured surface of fiberglass, scrape the area to be bonded with a razor blade or coarse sandpaper before using MAXI-CURE™ or any other adhesive. It also is best for bonding the tires for R/C cars.